With his superb two-volume biography of Elvis — Last Train to Memphis and Careless Love — Peter Guralnick has made himself the essential chronicler of Elvis’s story. Guralnick of course tells the true story of the day in December 1970 when Elvis met Nixon in the White House. The story of the visit provides insight into Elvis’s patriotism as well as comic relief in the denouement of Elvis’s life. The film Elvis & Nixon is playing in theaters now. It is “based on a true story,” as they say. The film, however, plays it strictly for laughs even if elements of it capture something true. This is my short account of the true story drawn from Peter Guralnick’s invaluable account. Elvis admired law enforcement officers and collected the badges of police departments he visited. In Los Angeles on a secret getaway from tensions at home in Memphis, Elvis became inflamed with the desire to be deputized by the federal Bureau of Narcotics and Dangersous Drugs (BNDD). He inveigled his friend Jerry Schilling to join him on a quick trip to Washington. Bodyguard Sonny West would fly in from Memphis to meet them. Elvis asked Schilling to take out some cash for the trip; Elvis ended up giving it away to soldiers returning from service in Vietnam. First I would like to introduce myself. I am Elvis Presley and admire you and Have Great Respect for your office. I talked to Vice President Agnew in Palm Springs a week ago and expressed my concern for our country. The Drug Culture, The Hippie Elements, the SDS, Black Panthers, etc do not consider me as their enemy or as they call it The Establishment. I call it America and I Love it. Sir I can and will be of any Service that I can to help the country out. I have no concerns or motives other than helping the country out. So I wish not to be given a title or an appointed position, I can and will do more good if I were made a Federal Agent at Large, and I will help out by doing it my way through my communications with people of all ages. First and Foremost I am an entertainer but all I need is the Federal credentials. I am on the Plane with Sen. George Murphy and We have been discussing the problems that our country is faced with. Sir I am Staying at the Washington hotel Room 505-506-507. I have 2 men who work with me by the name of Jerry Schilling and Sonny West. I am registered under the name of Jon Burrows. I will be here for as long as it takes to get the credentials of a Federal Agent. I have done in depth study of Drug Abuse and Communist Brainwashing Techniques and I am right in the middle of the whole thing, where I can and will do the most good. I am Glad to help just so long as it is kept very Private. You can have your staff or whomever call me anytime today tonight or Tomorrow. I was nominated the coming year one of America’s Ten Most outstanding young men. That will be in January 18 in my Home Town of Memphis Tenn. I am sending you the short autobiography about myself so you can better understand this approach. I would love to meet you just to say hello if you’re not to[o] busy. Upon his arrival in Washington on the morning of December 21, Elvis dropped the letter off at the White House and went off to a meeting (arranged by Murphy) with the director of the BNDD to seek a badge. He instead met with BNDD deputy director John Finlator, who refused Elvis’s request for a badge. Back in the hotel room, however, Schilling received a call inviting Elvis to the White House for a meeting with the president. Elvis’s letter had prompted internal deliberations over the wisdom of a presidential meeting. Dwight Chapin’s memo to Bob Haldeman summarizing Elvis’s request is a bit clueless. The second page of the memo has Chapin’s earnest advice and Haldeman’s somewhat more astute response. Chapin writes: “[I]f the President wants to meet some bright young people outside of the Government, Presley might be a perfect one to start with.” Haldeman responds: “You must be kidding.” The meeting was nevertheless promptly approved and arranged. 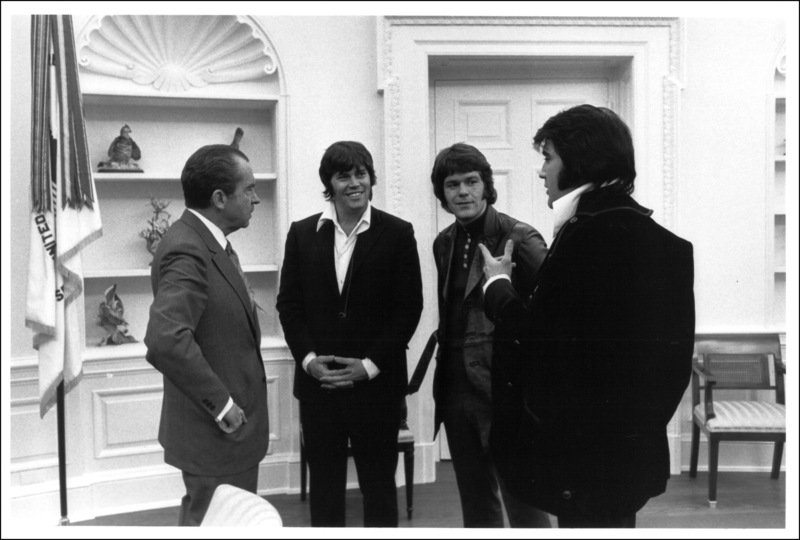 Elvis, Schilling, and West met up with White House aide Bud Krogh for Elvis’s 12:30 meeting with the president in the Oval Office. Presley indicated to the President in a very emotionial manner that he was “on your side.” Presley kept repeating that he wanted to be helpful, that he wanted to restore some respect for the flag, which was being lost. He mentioned he was just a poor boy from Tennessee who had gotten a lot from his country, which in some way he wanted to repay. Elvis was smiling triumphantly. “Thank you very much, sir. This means a lot to me.”…Elvis then moved up close to the President and, in a spontanous gesture, put his left arm around him and hugged him. Not done yet, Elvis asked the president if he would see his friends Schilling and West: “It would mean a lot to them and to me.” Schilling and West were ushered into the Oval Office. 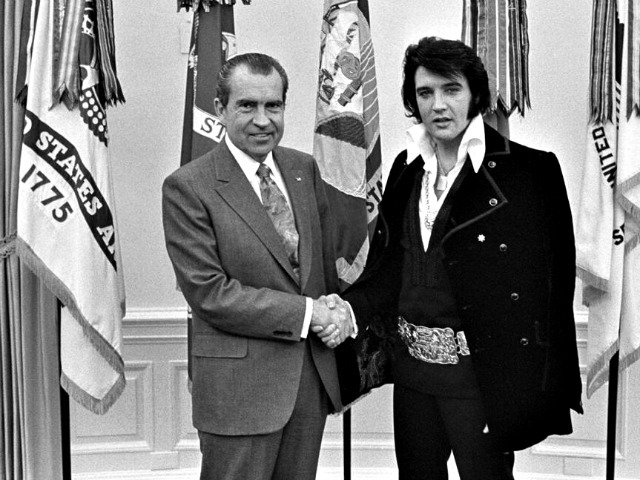 Nixon gave them the same tie clasps and cuff links with presidential seals that he had already given Elvis. Elvis prompted Nixon: “You know, they’ve got wives too.” Elvis and Nixon then rummaged through Nixon’s desk for suitable presents for the wives. The White House photographer took several photos to document the occasion. In the photo below West and Schilling have joined Elvis in the Oval Office with Nixon. After lunch in the White House mess and a tour of the White House, Elvis was presented with the BNDD badge by Finlator at Krogh’s office. Finlator promised to send along additional credentials. At least this particular chapter of the Elvis story had a happy ending.